Confit is one of my favourite ways of cooking meat; with something like a duck leg the meat will be amazingly tender and succulent, and the crisp crunchy skin giving a lovely texture contrast. It’s hard not to adore this. 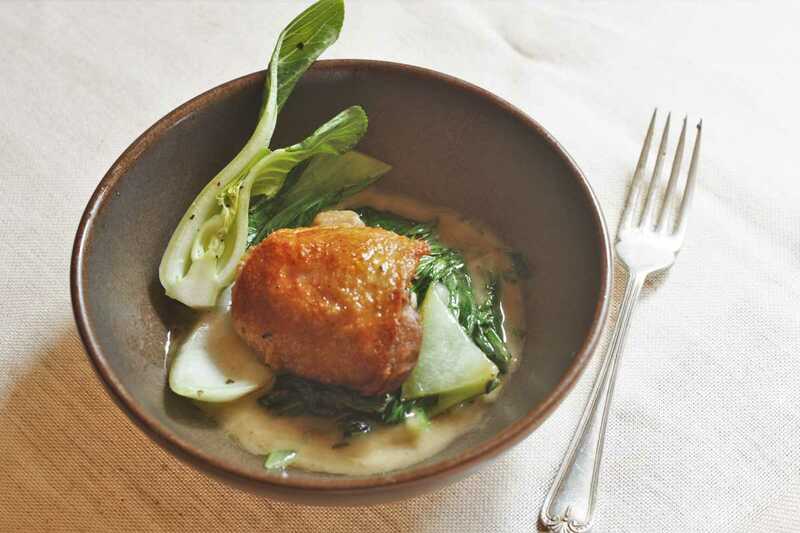 Chicken confit is not often heard of, but it’s a great way to elevate the humble chicken leg to new tasty new heights. Lemon chicken was something my mum often made when we were young. Simply place some chicken legs in a roasting tray with olive oil, lemons and seasoning and roast in a hot oven until golden and crisp. You get a load of amazingly tasty juices in the tray which are spooned over potatoes or mopped up with crusty bread. One of my favourite ever meals! So this is a new version of that dish; the confit chicken has a superior texture, and the lemon and olive oil dressing is enriched with the jus from the confit and loaded with chopped fresh herbs. For this one, I served it with some sautéed pak choi and buttered new potatoes. Firstly, cure the chicken legs by placing them in a tray and rubbing in a couple of handfuls of the coarse sea salt. Cover, and leave in the fridge for 6-8 hours. Set the oven to 140C. Wash off the salt from the chicken legs, then place in a pot and add enough duck fat to just cover them. Bring up to temperature on the stove to melt the fat, then cover and place in the oven for about 1 hour, or until the meat is just tender and almost falling off the bone. Remove from the oven and allow to cool completely in the fat. If you wish you can store the chicken legs like this in the fridge for several weeks. Remove the chicken legs from the fat. There will be a layer of chicken jus settled in the bottom of the pot; take this and reserve it for the dressing, it’s delicious! Get a pan hot on the stove, and fry the legs in a few tablespoons of vegetable oil until the skin is golden and very crisp. While the chicken legs are cooking, make the dressing. Mix the chicken jus with the juice of two lemons, and whisk in the olive oil gradually. Finally add the herbs, and adjust the seasoning with salt, pepper and a few drops of white wine vinegar.